Yesterday, my family and I hosted an Iftar Party at our home. It went very well and it was good to catch up with friends and family over a meal in this blessed month of Ramadan. 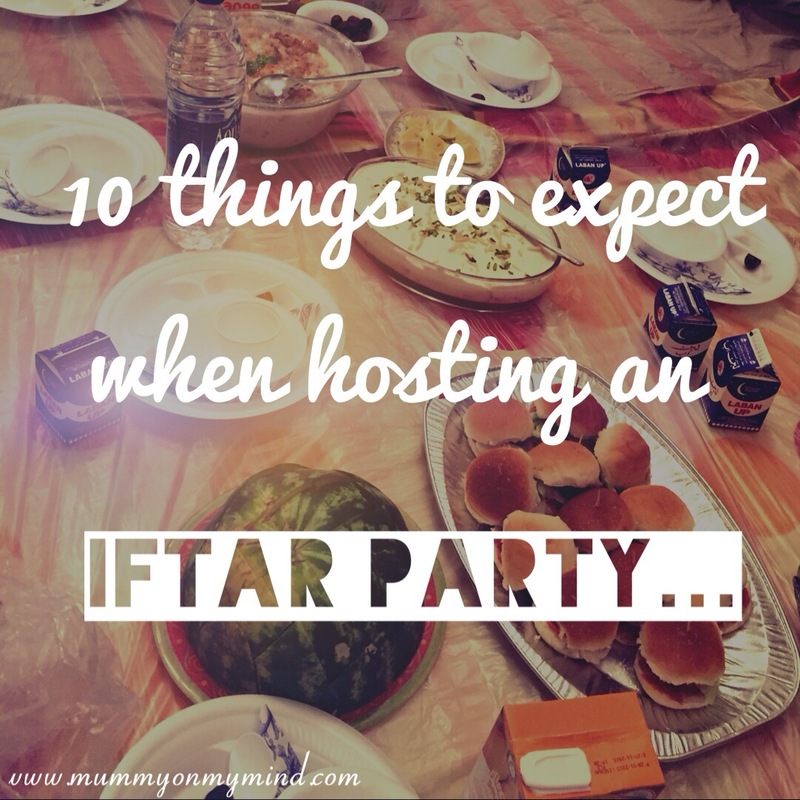 However, playing host for an Iftar party means that you need to be prepared for a few things. 1) Preparation can be slow. Hosting an Iftar party means preparations must be done on an empty stomach, so expect things to be slow. This means give your husband early notice (of about a week or even a MONTH) to move any furniture or hoover a particular room. 2) Guests to be on time. When hosting a dinner party during any other time of the year, guests are bound to be late. However, you can count on them during Ramadan, even if it means arriving five minutes before hand, because we are all going to be breaking the fast at a set time! Hooray! No need to chase up guests on the phone and ask how far they have reached, 45 minutes after the time they were supposed to arrive! 3) Modestly dressed guests. Be assured that makeup will be applied to a bare minimum, especially if it is a house party. The struggle to find the right balance between putting just enough pink lippy to add some colour to your face, but not too much that it is disgraceful is much is too real! 4) The moment of silence. This is just before everyone starts chewing on their dates as the Azan sounds nearby. Everyone says a little prayer, and you really get to appreciate the togetherness of family and friends at this particular time. 5) The look of confusion when you observe a homely tradition that your guests are not aware of. Every home has their traditions. In our home, my mother always says the Arabic prayer of breaking the fast right once the Azan is heard. Since moving to Dubai, this tradition is now carried out by my elder sister who prays the Arabic verses out loud and are repeated by the rest of us before we break our fasts. I could see that our guests were slightly baffled when this happened yesterday and it was rather comical to watch as they joined in midway. 6) A tea break between your starters and the main meal. During Iftar, the starter is normally consumed, and followed swiftly by the Maghrib prayers. Once the men return back from the mosque, there will normally be a tea break before the main meal is served. This is especially necessary for the caffeine addicts that want to avoid migraines caused by being deprived of tea or coffee all day. 7) Plenty of left over food. Que trying to cram all the leftover food into the fridge one way or another. This is more the case if you are Desi, because we have a desire to overfeed our guests. Cooking double, if not triple, the amount of food that is necessary is simply hardwired into our DNA. 8) Opened juice cartons that are actually almost full to the brim. Thanks to wanting to offer a wide range of refreshing drinks, guests will often open up cartons of juice, only to have a sip or tiny glass of it. However, being in Dubai means that all these cartons must be refrigerated if you don’t want them to go bad. On the plus side though, you have a TON of choice for refreshments for the next month or so. 9) Snappy hosts (or even guests). Guests may not notice this, but host couples may give each other the death stare from time to time. This is totally understandable as the hosts are running on empty stomachs before Iftar, and also low energy after Iftar since they have been carrying out hosting duties rather than actually tucking into the meal they lovingly prepared. Yes, my husband was prey to a death stare of mine yesterday when I caught him having far too much fun eating and chatting instead of helping me stop our toddler from trampling all over the food. Thankfully, these moments are short lived and only happen in the heat of the moment, soon to be forgotten the next moment. 10) Bidding your guests farewell in your apron. You haven’t even quite finished cleaning up yet, but the guests have to start leaving if they want to catch the Isha and Taraweeh prayers that are soon to follow. Thankfully, this means that the house is emptied very soon and you can get on with cleaning the mess left behind, and cramming all that extra food you made into the fridge. Yipee! Have you witnessed the hosts giving each other the death stare? Are there any additions to this list that you would like to make? If so, I would love to hear what you have to say, so please share your thoughts in the comments section below! It sounds like it takes a lot of patience and planning. Great job to you for having both to make it work. Doing it all on an empty stomach would be trying as well! Thank you for the informative post! Happy Ramadan. Thanks for appreciating the effort! It sure takes a lot of patience haha! Glad you found the post interesting. ? My husband and I just hosted an Aftar for his family the day before yesterday as well so this post definitely made me chuckle, especially numbers 6 and 7. I would willingly skip directly to the tea after the dates if it was acceptable ? As for cooking too much food, that is so true! I think I had to stuff at least 2/3 of the enormous amount of food I cooked into the fridge even after everyone had eaten their fill? oh well, like my father always says ‘it’s better to have too much than to have too little’ ? I think I would add ‘forgetting to put at least one of the drinks/condiments/side dishes you made on the table at Aftar only to remember it when you’re trying to make room in your fridge for leftovers’. Haha I’m glad you could relate! Your father is right, I think we would completely panic if there was a shortage of food so always better to cook PLENTY! Haha your addition is a classic! I remember my mum had forgotten to put out the desserts once which she had slaved over! Another time it was the salad! Haha! Great post! So accurate! My family hosted our iftar the first weekend of Ramadan, and experienced all of this in one way or another! Thank you for your positivity and I am glad you could relate to my post! Likewise, Lovely meeting a fellow muslim blogger! ? You’re welcome! Thanks for stopping by! ? Haha yes I suppose the death stare is common everywhere! Glad you found the post interesting! Thanks for stopping by. ? You are amazing! Preparing food on an empty stomach takes super-human willpower! Sounds like you had a great time. Enjoy munching your way through the left overs! Haha thankfully it was a team effort from my mother-in-law, sister and myself in the kitchen. The ladies that do it on their own are the true superwomen! It really was great fun though. Thank you so much for your positivity. Haha yes there have been numerous occasions where food has been missing salt or a spice, and it can get quite draining, especially when it’s so hot! Thankyou for stopping by. Haha no worries, I’m glad I could contribute to spreading some knowledge about Iftars and Ramadan. Thank you for hosting! ? Haha you’re right, it is quite perfect! Glad you enjoyed reading this post and thanks for stopping by!